Wi-Fi-Only 7″ Samsung Galaxy Tab Coming? Wi-Fi-only Galaxy Tab Coming April 4 for Only $399? NookColor is $250. But it has no cameras and it has to be hacked to become an Android tablet. The hacking can go smoothly — or not. But then when Barnes & Noble pushes out updates, the Sisyphean rock rolls down the hill again. Samsung 7″ Galaxy Tab has two cameras, faster CPU, same screen resolution (though perhaps colors don’t pop as they do on the NookColor), and it’s natively an Android tablet. A $150 premium over the NookColor is, I think, worth it for the Galaxy Tab. Mike, did you ever buy an iPad – or have I detected some recent anger directed Cupertino-way? I confess to have not been following your tech adventures lately. I really love mine and use it for far more than I ever thought I would. I have played with the 10″ Galaxy Tab at the T-mobile store. The form factor is nice, and I could see myself falling in love with one too – increased portability and all that. 7 inches might be too small for me. I’d suggest looking at the 10″ before dropping your money on the 7″ just to be sure. Take care. Mike, I’m an idiot. 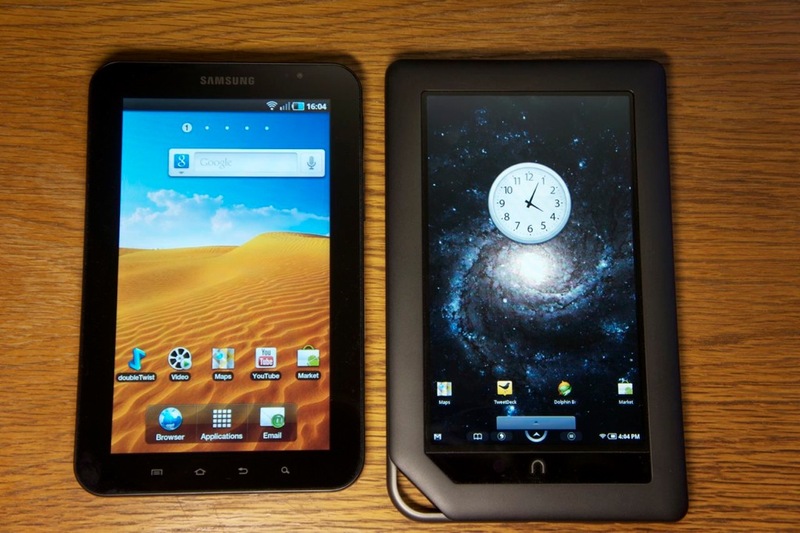 There is no 10″ Galaxy Tab – I played with the only size that exists – the 7″. Sorry for my confusion. I do have the 32GB WiFi only iPad, and find that it is perfect for my needs. I have not once wished for a 3G, although I confess to having a freely tetherable Android phone for the 2-3 times I found myself without WiFi access.